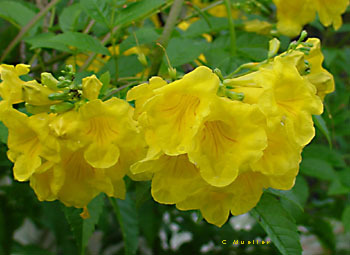 Esperanza, or 'Yellow Bells' (Tecoma stans) is a relative newcomer among popular, commercially available Texas garden plants. As native shrubs or small trees, Esperanzas could be seen and admired from a great distance in west Texas country landscapes when covered with bright yellow flowers, but the plants were tall and often took too long to come into bloom. Since the introduction of several improved varieties by plant breeders, Esperanzas have been utilized to provide masses of color in the landscape practically throughout the warmer periods of the season. The original Tecoma stans from northern Mexico and Texas often reached 15 to 20 feet in height, although in regions with frost they were never able to realize their height potential. Esperanza is closely related to desert-willow, catalpa, cross-vine, trumpet-creeper and other members of the Bignoniaceae family. Robert Vines in his book Trees, Shrubs & Woody Vines of the Southwest writes that Tecoma stans was long known and used by the Indian and Mexican peoples of the Southwest and Mexico for bowmaking, bee fodder and medicines. Also referred to as 'Hardy Yellow Trumpet,' it was included in medicines for diabetes and stomach cramps and was thought to have diuretic and anthelmintic uses. A sort of native beer was brewed from the roots. The cultivar 'Gold Star' was selected by Texas plant breeder Greg Grant from a private garden in San Antonio, Texas. It blooms much earlier than the standard Esperanza and appears to be intermediate in characteristics between Tecoma stans stans, (a more tropical variety) and Tecoma stans angustata of West Texas. In 1999 'Gold Star' became one of the Texas Superstar plants, with a top rating for being a spectacular heat-tolerant Texas native with striking masses of golden yellow, trumpet-shaped flowers and dark green, glossy divided leaves. The Texas Superstar program rated it as highly pest resistant, healthy and suitable for mass plantings or container use. This plant is capable of growing in many soil ranges, from the slightly acidic to alkaline. As would be expected of a plant so well known for so long a time, Esperanza has many common names: Yellow-elder, Trumpet Flower, retamo, retama, tronodor, tronodora, trompetilla, Gloria, Palo de Arco (another reference to its use as a wood for bows), Flor de San Pedro, Corneta Amarilla, Flor Amarilla, as well as a host of Indian names. Velvety Yellow Trumpet, var. velutina has softer, more downy leaves, and Elderleaf Yellow Trumpet, T. stans var. sambucifolia has leaves more reminiscent of those of the elder. The apricot-colored Esperanza is considered to be a bit more cold hardy than the usual commercially available Yellow Bells, which is able to survive mild winters as far as Central Texas. 'Orange Jubilee' is an orange cultivar, and 'Sunrise' is a variety that has yellow blooms veined with copper threads. All Esperanza varieties should be considered as tender plants. Occasionally they will survive the winter if earth is banked over the base of the plant. They may be propagated either by seed or by rooting cuttings.